I can’t believe it. Didn’t we just start Summer Short & Sweets? And here we are, August 24th, purple loosestrife blooming, lots of kids already back in school – although not mine – and this is our last official day of SS&S! Meanwhile, we have today. And today is SO exciting! I’ve been planning it for 2 whole months and trying to keep it a secret and let me tell you, it’s been excruciating!!! Your challenge for today is to take a good look at the picture below. Woweekazowee! That is some picture isn’t it? 2. The first 50-100 words (or more or less – whatever gets the creative juices flowing) of a children’s story, any level, (please specify PB, ER, CB, MG, YA) based on the picture. 3. The last 50-100 words (again, more or less is fine – whatever works for you :)) of a children’s story, any level (please specify PB, ER, CB, MG, YA) based on the picture. 4. Choose a character (there are at least 10 possibilities!) from the picture and introduce us to him or her – who he/she is, where he/she came from, how he/she got into this situation – a character sketch of sorts. 5. Choose a character and give us a one paragraph synopsis of the story told by the picture from his/her point of view. 7. A poem following the rules from Short & Sweet Week 3 based in some way on this picture. 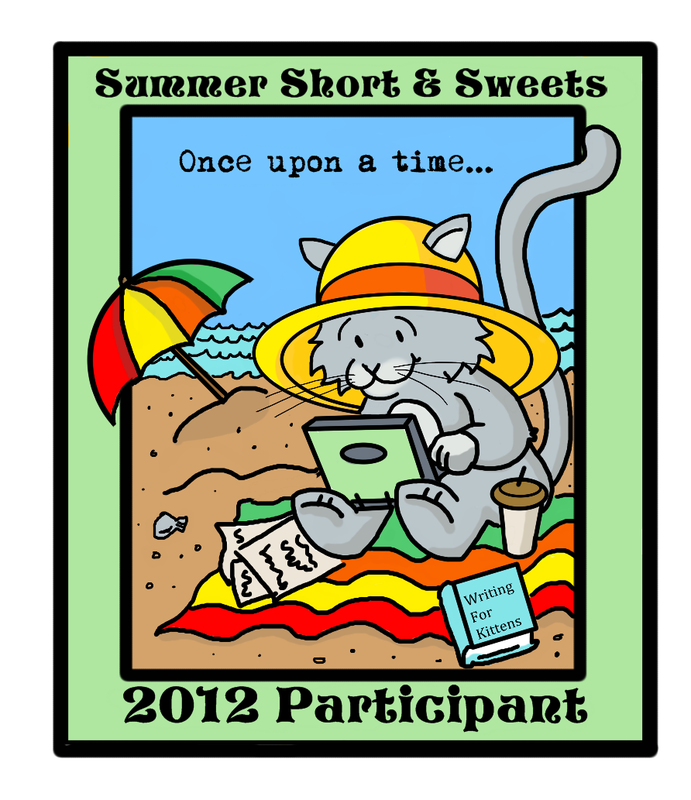 One added thing for you to think about: next Friday, August 31, will be our Summer Writing Contest!!! (I know! The mind reels at the excitement!!!) And guess what? It will be based on this picture! So any of you who would like to enter the contest can get a head start on your thinking this week by participating in the Short & Sweet. Just so you know, the contest will be for a children’s story of 250 words or less based on the picture and incorporating the some special key words, but I’m not telling those yet 🙂 Full details of the contest will be posted Monday. 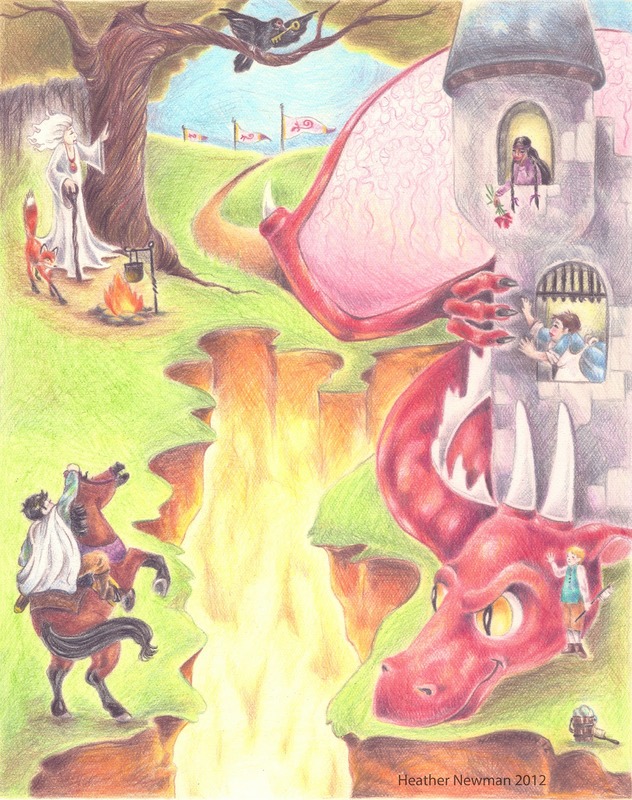 Grenadier, who would carry his knight anywhere, must cross the moat to save Cythrigg, the last dragon of Cyfarr, but finds he is unable to penetrate the magical fire surrounding Castlewellyn. As from the mists of Avalon, a new prince rises. Happy Writing, everyone! I can’t wait to see what you all come up with! As usual I’m sure we’ll all have story ideas coming faster then we can write them down sparked by our own responses to the exercise as well as everyone else’s. Have a great weekend, and I’ll see you Monday for Oh Susanna and the contest announcement! Ah! Going for 2, eh? Can't wait to see the story 🙂 Great title! #1: Prince Timothy just doesn't get that Princess Violet doesn't need rescuing. Cuddles, Violet's pet is a bit unusual, but he is completely harmless! Timothy thinks differently. Will he ever realize that a princess in a tower doesn't always have to be saved? First off…Heather!!! You! Are! One! Talented! Artist! The picture is amazing! There are so many possibilities!!! I'm going with a title for a poem or PB. By the way, Susanna, do we have to stick with what we chose today for the Summer Writing Contest or if we are further inspired by Heather's exceptional artwork, (which I know I will be), can we go in a completely different direction? She has such wonderful details that it has inspired several thoughts….several ideas!!! Posted by me but actually from Cathy! I am a firefox.Wiser than a parliment of owlsWith world-weary soul and infinite patienceWatching, waitingFor the foolish, careless humans,Taunting the hungry dragonStalking the sulfur smokeLike a smoldering fuse, I am a firefox. I persevered and crossed the finish line. Phew! before the dark knight claims her for his bride. Thank you, Susanna. The challenges were fun, intriguing, and tough. I look forward to participating in future ones. Heather your artwork is lovely! Excellent title, Karen. Glad to see you're still participating! Princess Philomena is caught in the clutches of the evil dragon Dyra, who hates anyone with a pure and innocent heart. Many courageous young men have failed to rescue the virtuous girl from the dragon, because underneath their armor lies an ungrateful and proud heart. Will Phillip the Brave and Benevolent cross the chasm and slay the ugly beast, rescuing the princess from a life of adversity? This was the fastest summer EVER. My kids school start next week. I'm a little happy and a little sad. Oh well…onto the prompt. I LOVE this picture. I'm so in awe of illustrators. Great job, Heather! Why is it that every prince in the kingdom thinks all he has to do to find his princess is rescue some beautiful maiden in a castle? It’s, like, so typical. The whiny girl with the lovely, long locks cries out, boo hoo, from a third-story window and every one of those silly princes trots up on his trusty horse to figure out how to cross the fiery moat and slay the demonic dragon preventing him from reaching his beloved. Puh-lease. Beauty is only skin deep, people. These girls in the castle? Materialistic, miserable, morons! Of course the princes never notice me. Why would they? I'm an old hag with a frightening fox by my side. Completely unapproachable! And that’s exactly how that dim-witted dragon wants it. Well, I’ve got to get these princes to notice me. I’m the princess, people! Only problem is I have this stinkin' one-hundred year spell to deal with. But, listen, I’m not about to walk around looking like warmed over oatmeal for another century. No way. No how. I’m going to get my prince and live happily ever after. Heather – LOVE. IT. The colors, the characters, the fiery pit of hell. Good stuff, lady! And you know I've been wanting to do a dragon poem based on your work, but it has NEVER come to me. I have three drafts about a dragon named Ida, all icky. Perhaps I can use the tidbit below as a starting point and finally bring this baby home. Thanks for the inspiration! Susanna, thanks for keeping us on our toes this summer, and I'm so glad our devious plot worked to keep the series going. If you're ever at a loss for a prompt, let me know – I'd be pleased to help you out with a nudge if I can! I am honored to have you among the “regulars”! Thanks for being such a devoted participant! 🙂 I do actually want to ask you about that book you mentioned… emailing soon 🙂 And I LOVE your title and that is SOME POEM! Fantastic ending! 🙂 Thanks so much for another terrific entry! Ooh! I like it! I am so impressed and amazed by everyone's creativity. So many fantastic ideas here and I want to read all the books that people's titles, beginnings, and synopses have suggested! Thanks for playing along for all 8 weeks, Jarm! Love this Tracy…Way to go!!! You did the 8 weeks!!! Congratulations!! And thanks for helping me to do it too!!! Title … “Sortex the Dragon oh Ladon”. Sir SuRupee, a sweet, gentle Knight, is no match for the fierce Piquant, the red dragon charged with guarding McCormick Castle. Guided by Cynomon a well-meaning, but clumsy enchanter, with astigmatism, Sir SuRupee and his phobic steed (who has a fear of fire) brave treacherous obstacles to rescue Princess ParS Lee SayAge, her hand maiden RowsMare E. and RowsMare's son, Tiehym. Savor the flavor of this spicy tale as this motley crew battle the fiery forces of evil. haha, an extremely long and over the top pitch.